Sound. Light. Immersive experiences. You’ve never felt anything like this. 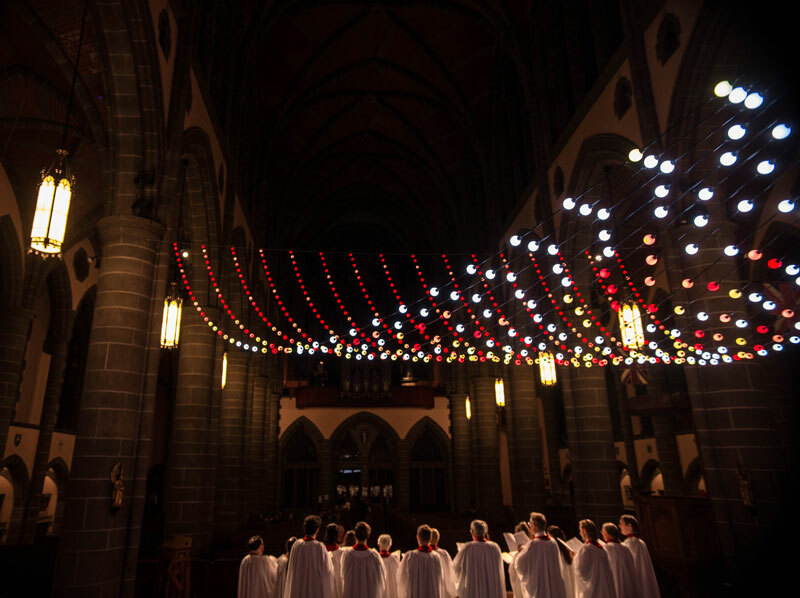 We design immersive lighting and sound experiences that stir the soul. It is our belief that simplicity is at the heart of all complexities. art pieces for events throughout the United States. bring your creative visions to life! TO ME, THE MOST BEAUTIFUL ART IN THE WORLD IS THE ART OF SOLVING COMPLEX PROBLEMS. THE BEST SOLUTIONS ARE THE ONES THAT LOOK/SEEM/FEEL SIMPLE OR ELEGANT. WE BELIEVE THAT SIMPLICITY LIES AT THE HEART OF EVERY SOLUTION TO COMPLEX PROBLEMS. 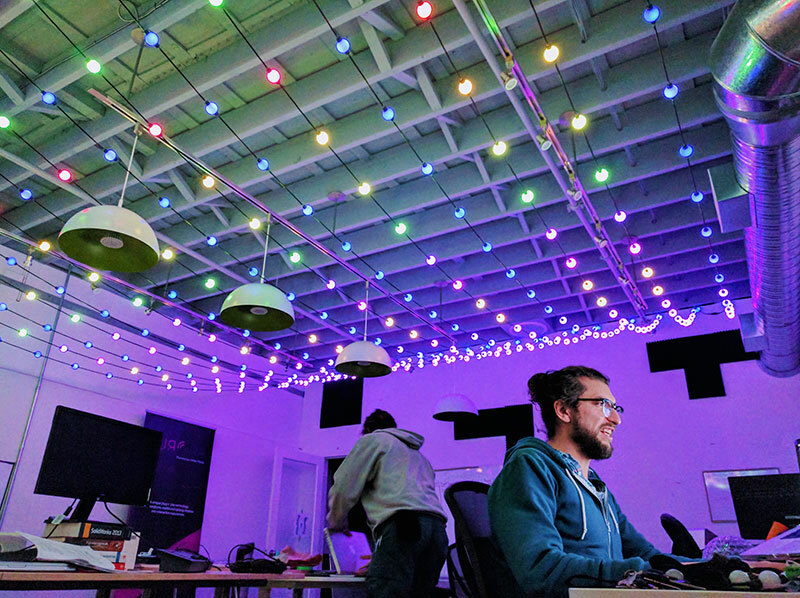 SOUND REACTIVE LIGHTING IS A GREAT EXAMPLE. 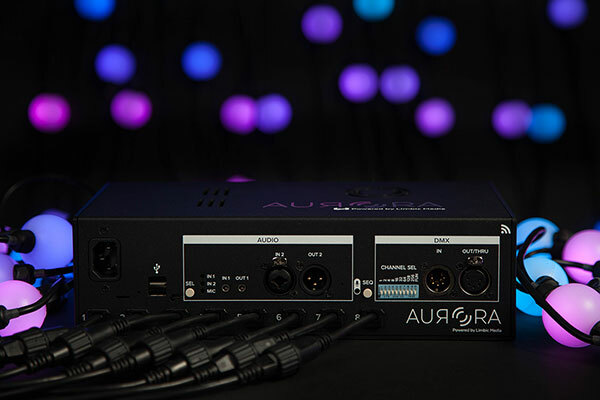 WHEN IT COMES TO ARTIFICIAL INTELLIGENCE, NO ONE HAD IT FIGURED OUT UNTIL LIMBIC MEDIA DEVELOPED THE AURORA SOUND REACTIVE LIGHTING CONTROLLER. IT IS AN ABSOLUTELY BEAUTIFUL SOLUTION – AND STUNNING – AND FLEXIBLE. NOTHING ELSE EVEN COMES CLOSE. needed. No complicated software required. 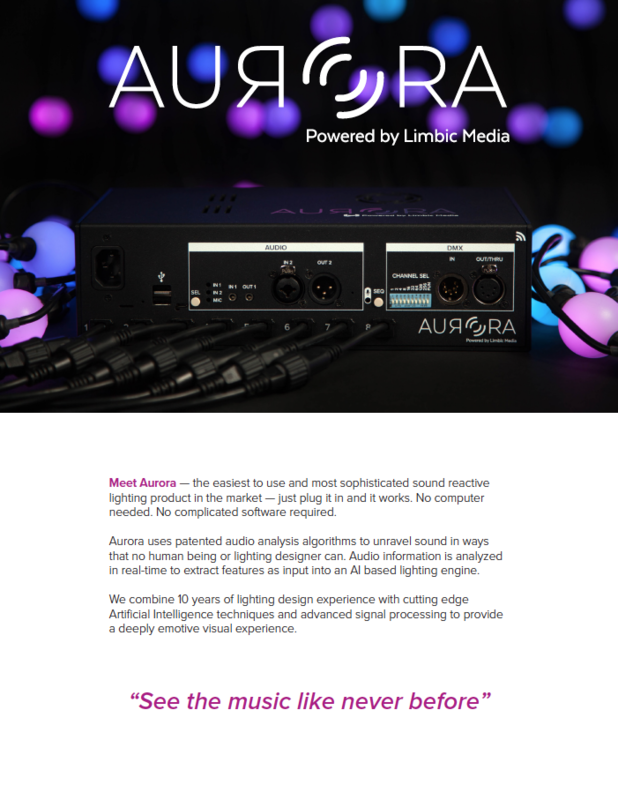 Aurora, powered by technology developed by Limbic Media, uses patented audio analysis algorithms to unravel sound in ways that no human being or lighting designer can. 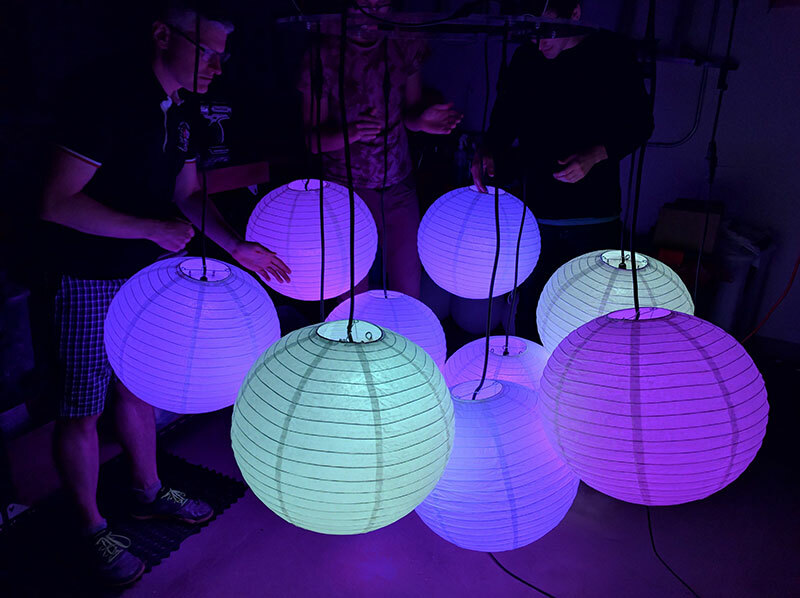 Audio information is analyzed in real-time to extract features as input into an artificial intelligence based lighting engine. 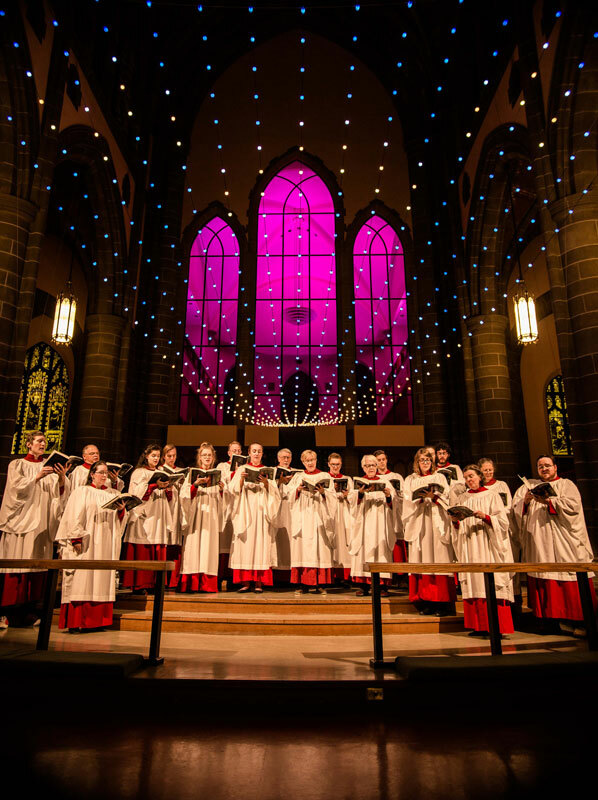 The result is a combination of decades of lighting design experience with cutting edge artificial Intelligence techniques and advanced signal processing to provide a deeply emotive and immersive audio and visual experience. The Aurora system is the heart of our creations. The stand alone Aurora system is available for rent or purchase – as are any of our individual art pieces. 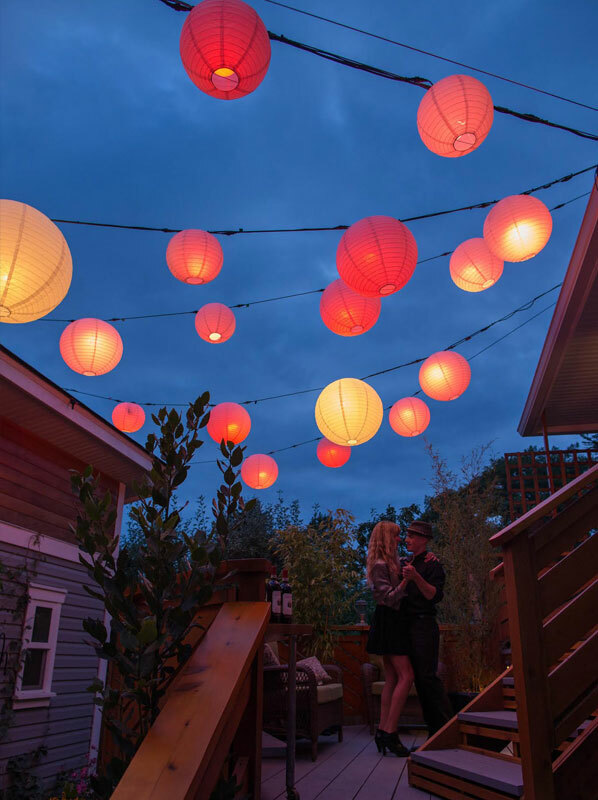 We can also work with you to create something one-of-kind that will be unique to your event/venue. We can provide any variety of pixel sizes, types and elements to help fit your venue perfectly. Available for rent or purchase as a stand alone unit. 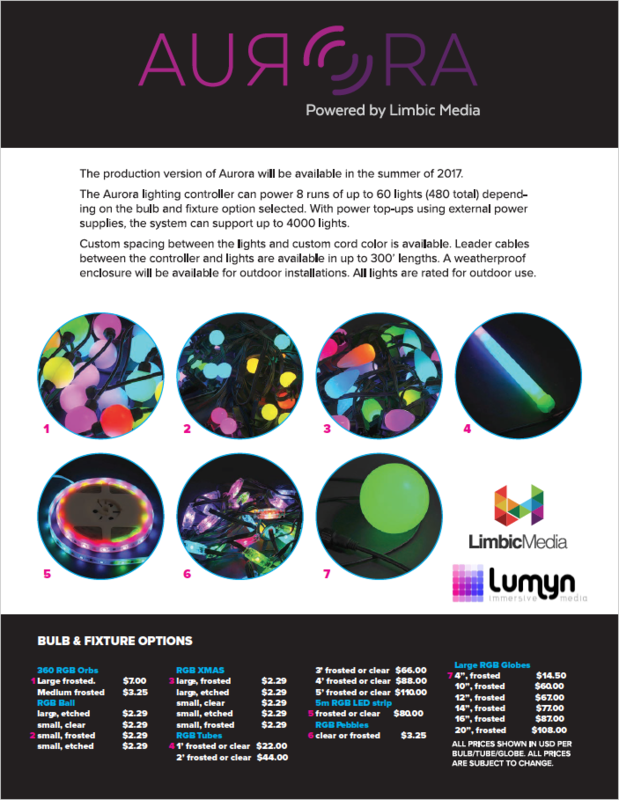 Add any of our RGB pixel form factors (see below) to help bring your vision to life. Available in a variety of form factors for rent or purchase. 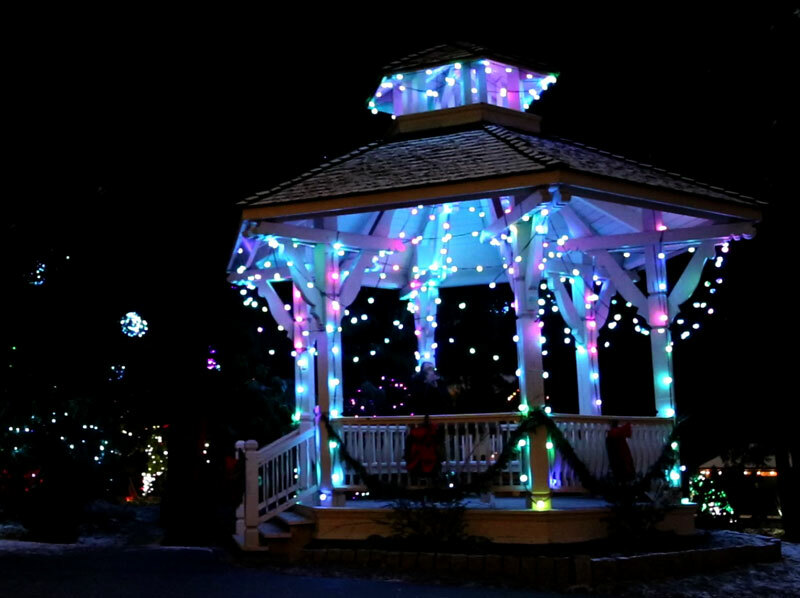 Including RGB orbs, clear or frosted RGB balls, C7 and C9 frosted Christmas lights, 1′ – 5′ long frosted or clear RGB tubes, RGB LED strips, RGB pebble strands and 1″ – 20″ large RGB globes. 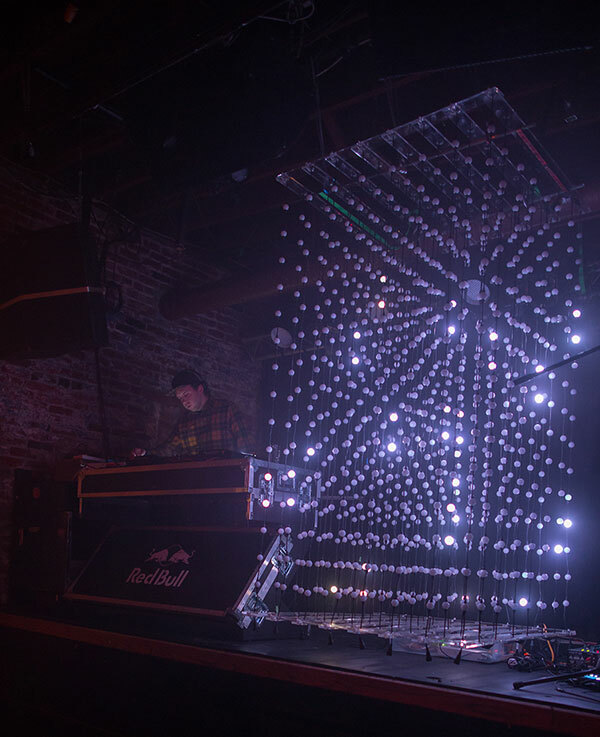 Prismo is an 8′ x 4.5′ x 4.5′ 3 dimensional sound reactive 3D art piece designed for permanent installation in office complexes, nightclubs and entertainment complexes and is available to rent for events. It’s a stunning attention getting that works great for product launches and exhibits. 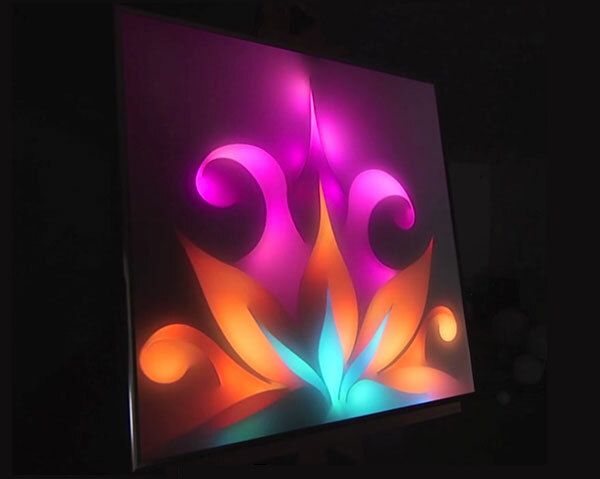 Light paintings are custom acrylic designs that are backlit with motion and color changing RGB LED lighting to give the effect that the acrylic pattern is being ‘painted’ with light. These make great additions to homes, offices, bars, nightclubs, entertainment venues, casinos and many others. We have the experience and access to the technology to help you bring to life just about any vision imaginable. 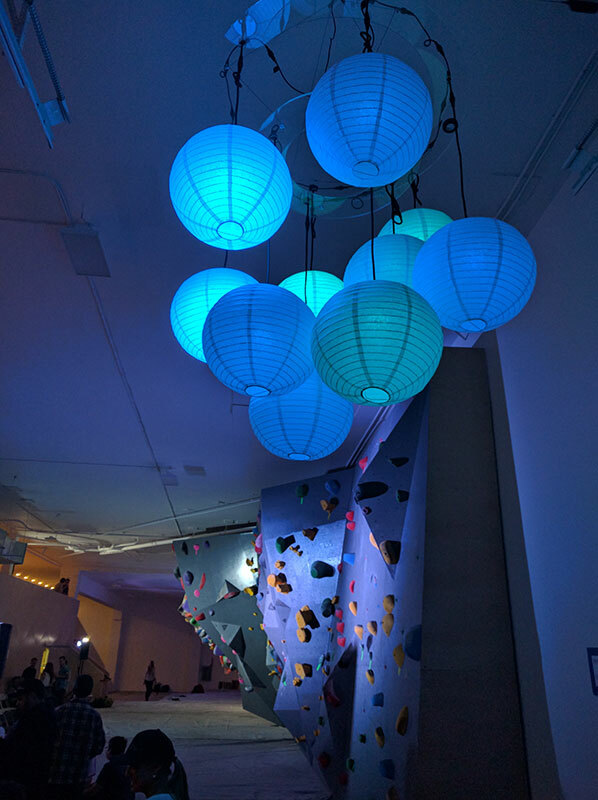 From sound reactive chandeliers and ceiling light art to customer interactive settings for product launches, exhibits, or events; we can help you bring your most complex visions to life. Most of our items and technologies are available for purchase or for rent. Just let us know more about your project and we’ll be happy to provide a quote to help bring your vision to life! 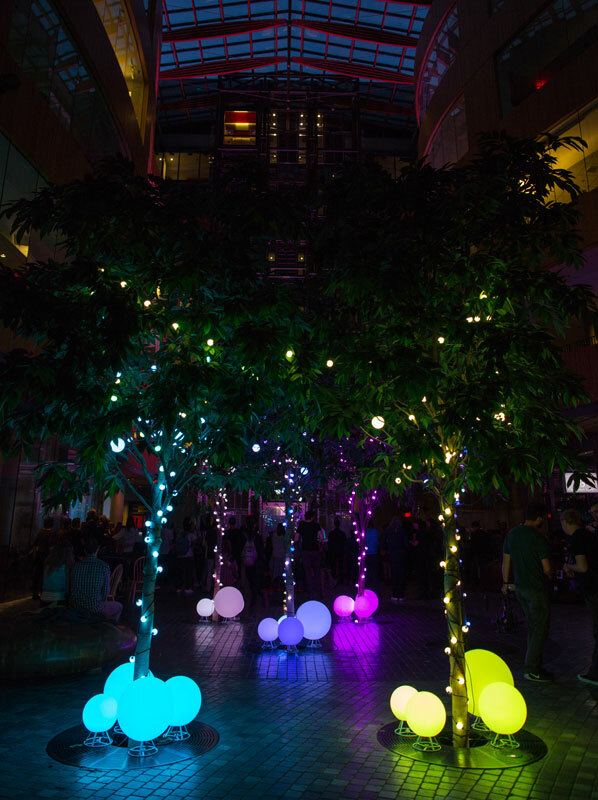 We have decades of experience in lighting control, light show design and technology development and are available to help with your project too. Contact us to see if we would be a good fit for your project. 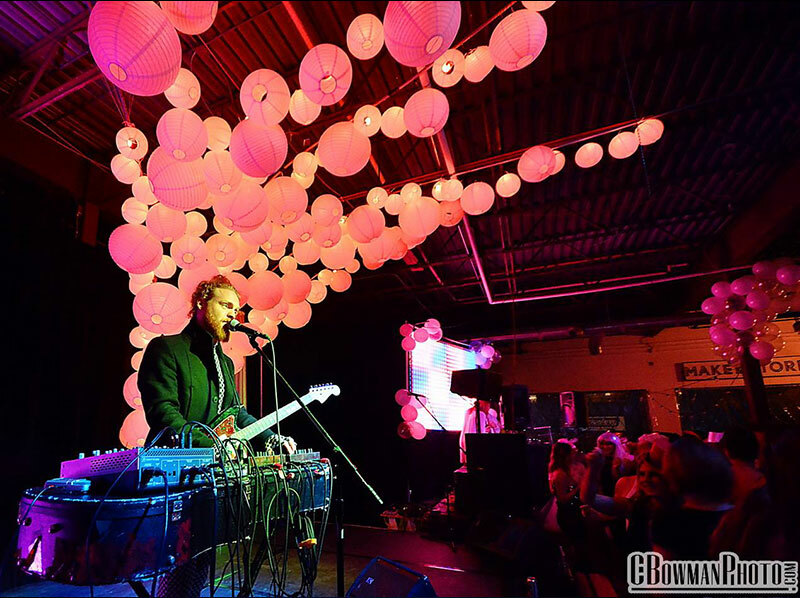 Imagine your venue/event coming alive to the environment. Be it the sound of voices and conversation or the sound of music pumping from your DJ or live act; we are designing a line of nightclub and event furniture including tables, chairs, bars and decorating elements that will come alive in your environment. Imagine being able to use pyrotechnic effects for your events even if the event is indoors and/or in a location that does not allow pyrotechnics! We have discovered an amazing technology that allows us to do just that. Our flameless flame cannons should be available soon for rent or purchase. Production Lighting Manager, Hollywood Lights Inc.